Say goodbye to gas stations with the all-new and exciting 2017 Nissan Leaf. The Leaf is 100% electric which means you’ll never need to worry about how much gas goes up overnight, or during the holiday weekends. Here at Antelope Valley Nissan, we’re just as concerned about preserving our beautiful environment as you are, and that’s why we’re proud to carry the 2017 Nissan Leaf. Being 100% electric means the Leaf doesn’t use a single drop of gasoline which means it produces no fumes and zero emissions. The 2017 Nissan Leaf also has fewer moving parts than any other vehicle that you’ve ever owned, and that means you’ll be able to say goodbye to those pricey tune-ups and maintenance work that keep the many moving parts of other vehicles in working condition. The 2017 Nissan Leaf has been designed to maximize efficiency, and not just with its electric engine. Its aerodynamic design has been artfully crafted to help reduce drag, and provide more fun per every kilowatt. 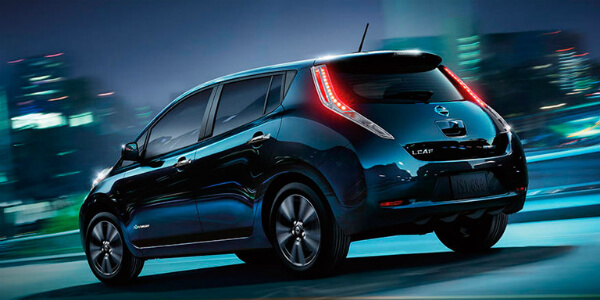 The 2017 Leaf also takes advantage of a regenerative braking system that helps to charge the battery every time you press the brakes or coast. 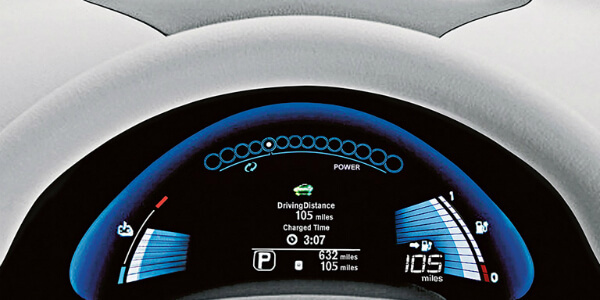 A convenient meter located on the dashboard of the Leaf is able to inform you when you’re using power, or gaining back energy by coasting and braking. With room for five, the 2017 Leaf is one of the most spacious electric vehicles out there. The 2017 Leaf also features heated seats throughout the cabin so there will be no more arguing over who gets to ride shotgun. While all the normal drive modes such as park, reverse and drive are still available on the 2017 Leaf, shift into B-Mode in order to increase the force of the regenerative braking system and the brake response so you can keep your Leaf charged longer. Here’s the moment we’ve all been waiting for. How far can I get when my Nissan Leaf is fully charged? The 2017 Nissan Leaf has a maximum range of up to 107 miles. With advanced technology that gives you up-to-the-minute updates on your battery’s charge levels, you’ll always know how far you can go before you’ll need to charge up again. Available on the 2017 Leaf is a solar-panel rear spoiler that is able to convert sunlight into the energy that powers all of your accessories. This means you’ll be able to get the most out of your 107-mile range, and won’t need to worry about playing the radio too loud, or having the headlights on for too long. While we could keep going on and on about the many more features that the 2017 Nissan Leaf has to offer, we know that you’re ready to check it out for yourself. Take a look on our website, or head on over to our dealership in Palmdale to take a look. If you have any questions while you’re looking, one of our knowledgeable and friendly team members will be more than happy to help you out, and give you all the information you need to drive home a 2017 Nissan Leaf today. If you know that you want to test drive a 2017 Nissan Leaf, or any of our other amazing vehicles here at Antelope Valley Nissan, you can schedule a test drive right from our website. You pick the time and day, and we’ll have the keys ready for you.